I always get worried when British politicians cite Sweden in their analysis of anything. It’s excellent to look to a country that’s a model of Social Democracy as an example, but the lessons learnt are often wide of the mark. It was Michael Gove that twisted Sweden’s ‘state schools run by private firms’ example to inform Tory policy, and today he’s at it again – this time about the role of men in society. Gove, writing at Comment is Free, states: “In Sweden, the introduction of flexible parental leave helped increase the amount of time fathers spent with their young children and helped the divorce rate fall by 30%.” Sounds good doesn’t it? 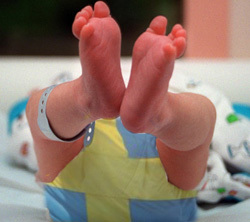 Well, Sweden actually has the highest percentage of kids born to non-married couples in the EU, 55% in 2004 according to Eurostat. So you can’t actually equate parental leave and the divorce rate in the way Gove would like to make us think – for more than half of babies anyway. Plus even if you could, what about the total amount of parental leave available as well? Using that statistic would show Sweden at the top and the UK at the bottom – see the graph from Wikipedia. How would that look to all of the reactionary Tory supporting small business people who would bay that more rights for parents was damaging their business? It’s not just the flexibility of leave, it’s the amount of leave and the financial implications too. In short Gove’s article looks like traditional Tory family values with some of the rougher edges slightly smoothed. Turns out that if you look at numbers of divorces in proportion to the numbers of people getting married in Sweden there’s not even a decrease – Eurostat page here. So it’s just that less people are getting married. Why is the choice of EP President more interesting than choice of Commission President? And it is because they use Sweden as an argumentative basis that you can nail them down to the full story!